It’s only been two days, and I am already fretting about the effects of the antibiotics on Nolan’s healthy intestinal flora. Fortunately, he likes yogurt-based smoothies and tuna salad with yogurt and LF dill pickles, but I was also compelled to get some ferments started in the past week or two—a fresh batch of sauerkraut that my mom helped pound out, and a jar of preserved Meyer lemons. 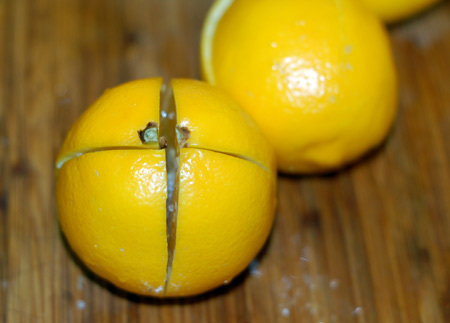 Meyer lemons are a hybrid variety that have been all the rage in recent years. They are less tart and more fragrant than your basic lemon, with thinner, slightly more orange skin. From what I understand, they are an excellent choice for preserving in salt and whey, a procedure that could hardly be easier. I just sliced my lemons into quarters through the stem end, leaving them just barely connected at the blossom end, and sprinkled their cut sides with coarse salt, in my case some gorgeous Hawaiian sea salt that was a gift from our friends a few years ago. Separating the quarters to make room for the salt gave me flashbacks to the paper cootie-catchers we girls used to make and play with in elementary school. Then I smooshed the lemons together into a large jar, packing them down as well as I could, and covering them with some additional fresh-squeezed lemon juice and a few tablespoons of freshly drained whey. After two weeks of fermentation, they should be ready to transfer to the refrigerator and use in my cooking. 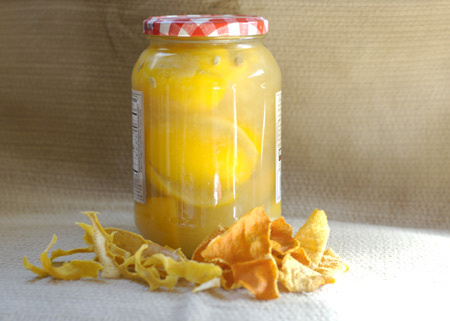 As long as I was squeezing organic lemons for juice, I was not about to waste all their zest; I made sure to peel off every bit I could, and transferred it to my dehydrator for a few hours. It made the air fill with the scent of citrus, and I ended up with a big handful of crispy lemon zest “chips” to store for future zesty needs. I’ve tried this before in my oven and had poor luck; it either burned them or left enough moisture in to promote mold, but I feel very good about the end result this time around. I decided to leave the strips whole for now rather than pulverize them in my spice grinder, and have already used them in several recipes, including the chicken-coconut soup I wrote about yesterday. They rehydrate good as new, and can be minced or julienned just like fresh zest. I also made a batch of dried orange peel while squeezing clementines for an orange chicken marinade a few days ago; since clementines are so easy to peel with your fingers, I just did that and then removed the pith with my chef’s knife held parallel to the cutting board. The orange zest came out equally dry but less overtly fragrant than the lemon peel, and I anticipate using it for everything from main courses to baking to steeping tea. Nolan isn’t a big fan of citrus, but he spent a long time chewing on the outside of an organic lemon last time we took him to the grocery store, so hopefully I will be able to sneak bits of probiotic preserved lemon into his diet one way or another. In the meantime, anyone have a brand of cod liver oil that they swear by? We really need to build up our immune systems! Oooh! This looks great! I have a lemon tree out front bursting with lemons. I know what you mean about the immune system. I think my kids and I caught every bug possible since Christmas! I heard good things about colloidial silver, too. Wow. Wow, wow, wow! This makes me want spring to come yesterday. They say Meyer Lemons are like love. Sometimes hard to find, but well worth the wait. That’s for sure true for me. PS. Hope Nolan is feeling much better now that he has taken on such a healthy diet thanks to his Mom.